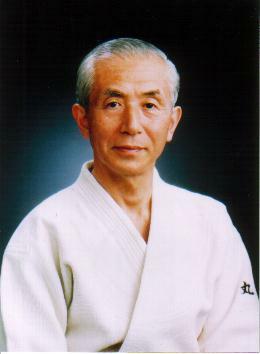 In May of this year (2015), the World Friendship Seminar was held in Matsuzaka City in Mie Prefecture by Minoru Oshima sensei, who is the president of Kodokai Aikido International, and Yoshitake Hashimoto sensei, who is the president of Junshinkai Aikido. I was invited to teach and I was allocated half of the time during the 5 days over which the seminar was held. The seminar was attended by the head of Aikido Yuishinkai Russia, Mikhail Orlov, and some of his students. At the seminar, I talked about the concept of ‘centre pole’, and I know that Mikhail has already posted what I said on Facebook, which has since been shared by Julian from Argentina and others, so this will be familiar to many of you. Nevertheless, I would like to take this opportunity to share my thoughts in my own words. Ancient Japanese people believed that the gods descended through large trees that pierced the heavens. Japanese gods are what modern physics describes as ‘cosmic energy’, which the ancient people felt in their souls. The people experienced the energy of nature in everything and felt that the gods resided in all phenomena. In particular, they believed that great energy (gods) descended from the heavens through large trees and they built their settlements around these trees. These trees were called “goshinboku” or divine trees. As I’m sure you are aware, the living part of trees is on the outside, near the bark. The trunk dies in the centre and becomes hard, forming growth rings. In this way, the hard, dead trunk supports the living part of the tree as it reaches for the heavens. Ancient Japanese people knew this and believed that the reason they were alive was because of support of the spirits of their deceased ancestors, which is why they valued the graves of the deceased so highly and gave prayers of thanks every day. Ancient Japanese people called these large, hard trees where the gods resided “hashira” (pillars). This is why when spiritual people in Japan count the gods, they use the counter “hashira”. They continue to believe that the spiritual power that gives life lies in a vertical line down the centre. Because of this, the most important pillar of old houses was always placed in the centre. This pillar was called the “daikokubashira”. Japanese people held the view that in any given space, there is always a centre point. Japanese shrines, temples, and castles always had a symbolic central pillar. This is called the “shinbashira” (centre pole). Because old Japanese buildings had a shinbashira or a daikokubashira, they were able to survive for hundreds or even thousands of years, even in a country that is as prone to earthquakes as Japan. As you know, the earth orbits the sun. The earth also spins on its own axis. The universe is comprised of objects that spin and orbit each other. When an object spins, it develops an axis. This axis is the shinbashira (centre pole). The human body has been called a miniature universe, and it is believed that it is home to the ‘gods’ (energy). This is why the movement of aikido uses the human body as an axis and draws circles around it. This year, I developed ‘centre pole training’ to help my students to internally master and gain a physical awareness of the ‘centre pole’. Japanese Yuishinkai members have been practicing the ‘Aikido Yuishinkai kata’ and ‘centre pole training’ at home each morning and evening. The founder of Aikido, Morihei Ueshiba O-Sensei, said that “aikido is love”. I feel it is my role as one of his last remaining direct students of to dedicate myself to his spirit through ‘the gods’, or in other words, through ‘love’.